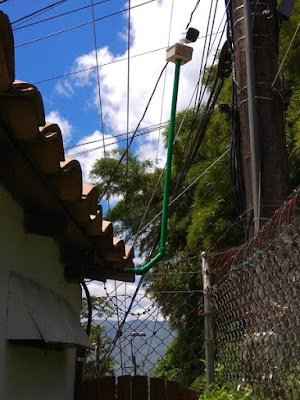 An Englishman in Colombia: Upgrading Security! Two nights ago, the new security camera started playing up, it has been and continues to be fine during the day, but when it comes to night time and it relies on the infra-red leds it has struggled. As a result the Company that installed it came out yesterday, and decided that there is not enough power to the camera, for it to function properly, therefore they installed a power adapter. However, I wanted more, I was not very happy with my 'new' camera mast, I had made it from PVC water pipe, but it is too flexible, and in high winds, there is a lot of movement, given time, maybe years down the road, the PVC will have weakened and will snap. So I wanted to take the opportunity to replace it with a metal version, I had been advised that this could lead to a lightening strike, which was why I had tried PVC, but it is going to be the only option. We also have a blind spot, the other side of this camera, we often hear things going on down the road, but can only see uphill, and there are times when people, especially children are coming up to the fence, taunting the dogs, and I want to stop this, so the old camera, is going to be installed on the same pole, using the same cable, as there are unused wires within, that can power it. It was arranged that they will return tomorrow, Thursday, to install the fourth camera, that also gave time to see if one power adapter was sufficient to power two cameras with the infra red, and it isn't, so there will need to be an adapter for each camera. 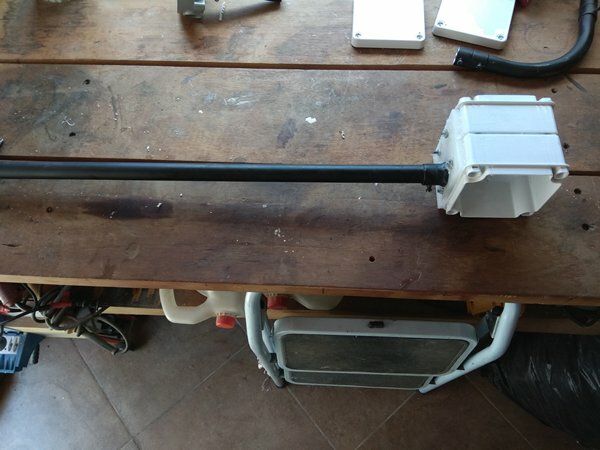 In the mean time I have made the new camera mast, nothing is easy in Colombia, you can't just go and buy a camera mast, or a TV aerial mast for that matter, even the installation company has to have them made up, when I had the cameras installed initially I asked them to do that for me, thinking it would be professionally done, but I was never happy with their weedy version. 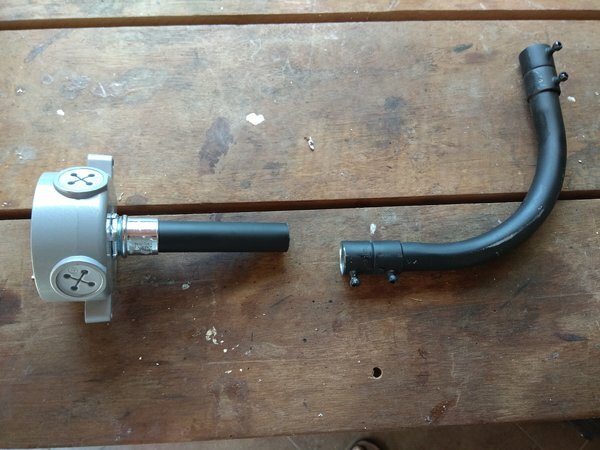 I bought some 3/4" steel conduit and fittings, then set to work. 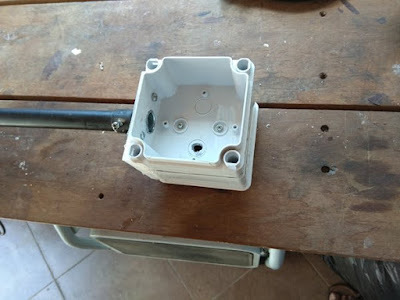 this will take the cable up to two 10cm junction boxes that I have sealed together, and drilled to take the connections for the two cameras. They are sealed with mastic, back to back, and down to a platform cut from a plastic kitchen cutting board, then bolted both together and to the platform, so hopefully they are there to stay. All the metal has been spray painted matt black (left over from the desk project), both to protect it from the weather, and hopefully make it less of a target for lightening.